The azooxanthellate coral Acabaria biserialis Kükenthal, 1908 (Octocorallia: Alcyonacea) is highly abundant on the vertical underwater structures of the oil jetties at Eilat (Red Sea), but it is rare on the adjacent natural reefs. To understand its success on such artificial substrata we examined various aspects of its life history and population dynamics. A. biserialis is a gonochoric brooder. The percentage of colonies on the artificial substrata bearing gonads ranged from none (September 1994 and 1995) to 100% (January 1994, 1995 and April 1994). Mature oocytes and sperm sacs reached rather small maximum diameters of 240 and 160 μm, respectively, probably dictated by the small gastrovascular cavities. A continuous release of planulae was observed in the laboratory from March to July 1995. Planulation occurred during various lunar phases, and both by day and night. Recruitment of A. biserialis on PVC plates attached to the jetties coincided with the breeding period inferred from the laboratory findings. Recruits reached a maximum height of 3 cm within 3 months, thus exhibiting a remarkably rapid growth rate compared with other gorgonians. This high colony growth rate may compensate for the lack of clonal propagation in the studied A. biserialis population. The complex substrata of the jetties provide the conditions required for successful colonization, which include upside-down orientation, an adequate light regime and exposure to flow. 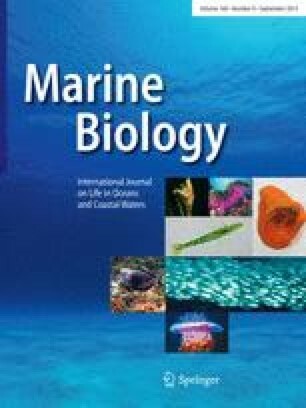 The findings of our study may provide a useful contribution to the design of artificial reefs aimed at attracting rapid colonization by A. biserialis colonies.